– This was the perfect match to open the TLC pay per view. Both Ryder and Ziggler have the in-ring talent to put on great matches when given the time, and tonight proved that. I really would have loved for these 2 to prolong their feud until Wrestlemania 28 and have it culminate there, but I suppose beggars can’t be choosers. – Having Zack Ryder win the United States Championship was the right move for both superstars. Ryder finally wins his first singles title in the WWE, and Ziggler can now move up the card and get involved in the WWE title picture where he belongs. – I have said this countless times before, but is there any move that Dolph can’t sell to perfection? Just watch how he sells the Rough Rider finisher, and you can see what I am talking about. – Why was this match not advertised? These teams have built up a feud over the last few weeks and could have had a proper build to this match. Instead, the match isn’t promoted, which results in the crowd being absolutely dead. Following the Zach Ryder and Dolph Ziggler match didn’t help their cause either. – As far as tag-team matches go, this one was as basic as they come. I would like to see these teams continue their rivalry and perhaps have a better match at the Royal Rumble. Air Boom and Epico/Primo are the only relevant teams in the division, so they need to continue working together to bring some importance back to tag-team wrestling in the WWE. – I wish the trio of Primo, Epico and Mendes had some sort of stable name. It just sounds weird to call them Primo & Epico every time they have a match. By the way, what ever happened to Hunico? – I really should have seen this one coming. Barrett has gotten the better of Orton for the last couple of months, so giving Randy a win was probably better for business. It has been noble of Orton to continue pushing the younger talent on the roster, but you can only do that so much before you start looking like a loser yourself. – This match was a little to slow for my taste. I have seen better work out of both superstars in the past, and considering that this was probably the blow-off to their feud, I just wished I could have seen a little more action and a little less defense. – So what does Wade Barrett and his “Barrett Barrage” do now? I assume his feud with Orton ended at TLC, so now who does he go after? I am just worried that this loss may have killed his momentum and he may go back to being lost in the shuffle. 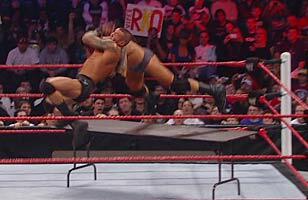 – Even though we have seen the “R.K.O” get pulled out of nowhere countless times, the way Orton delivered the move to Barrett as he crashed through the table was still very impressive to watch. – How much time was the WWE really trying to fill last night? That makes 2 matches in the first hour or so of the show that were not advertised. No offense to Kelly Kelly and Beth Phoenix, but they had no business fighting on the card last night for the 5th time in as many pay per views. The crowd didn’t care about this match at all. – The WWE Divas division is hanging on by a thread at this point. It needs to get some new faces involved in the title picture, like Alicia Fox and the returning Layla and Kharma. The fans are getting bored with the constant Divas Championship triangle that is Kelly Kelly, Beth Phoenix and Eve Torres. – I was surprised with how into this match I ended up being. Considering we had two wrestlers who are both over the age of 40 and have had numerous surgeries on their knees and legs competing in a Ladder Match, I wasn’t going in expecting a classic. To the credit of both Hunter and Kevin, they made this bout work. They told a story from start to finish and were able to get the crowd interested in what they were doing. – This will probably be the last time we see Kevin Nash competing in a WWE ring. Even though the match came off without a hitch, you could clearly see that Nash was immobile and had a hard time running and even walking. He had a great match with his real-life friend Triple H, so now is as good a time as any to call it a career. – I really loved the finish of the match. Having Nash throw up the “Kliq” sign, only for HHH to crotch chop him and nail him in the head with the sledgehammer was a fitting ending to this feud. – ANOTHER UNADVERTISED MATCH!? I realize that the company wants to give Sheamus as much exposure as possible, but this is getting ridiculous with all of these unannounced matches. All this bout was designed to do was get Sheamus on the card and make him look dominant. – Sheamus really needs to find himself someone decent to feud with. Ever since Christian went down with an injury, Sheamus has been left to do nothing more than take out jobbers like Jinder Mahal and Heath Slater week after week. If I had a say in what happens next with “The Great White”, I would put him in a feud with Wade Barrett. A Sheamus/Barrett feud could be strong enough to lead to a match at Wrestlemania 28. – I was upset with how bad, slow and short this was match was originally. That was until I heard that Mark Henry had apparently sustained a serious groin injury this past week on Raw against John Cena. That at least explains why this bout ended up the way it did. If not for what happened right after this match, this would have ended up being a huge disappointment. – Surprise! Daniel Bryan is the new World Champion! I didn’t see this coming at all. Thank god it happened too. 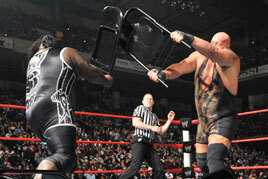 Otherwise the prior match with Henry and Big Show would have buried the crowd for good. – I am a little upset to see that the WWE went in this direction. I was really hoping that Bryan would be the first MITB winner ever to cash in his briefcase at that years Wrestlemania. It would have been nice to see Daniel Bryan competing for a World Championship at the biggest show of the year. Now that he is champion, I am not at all confident in his ability to hold on to that title until then. I hope I am wrong though. – What was with all of the sneak attacks by Rhodes throughout the night? I rather would have seen just one attack during Booker’s entrance and left it at that. It basically gave away that Cody was going to win the match. – This will not be the last time we see Rhodes and Booker in the ring together. I fully expect some sort of retribution on Booker’s part and a rematch for the title at the Royal Rumble. Last night was a good sign that Booker has a lot left in his in-ring arsenal and can still put on great matches. Give these guys 10-12 minutes at the Rumble and let them steal the show. – Rumor has it that Goldust (Cody Rhodes actual brother) might get involved in this feud. It would make sense at least. Booker and Goldust are former Tag-Team Champions. I wouldn’t mind seeing the golden one interject himself into this feud. It would work on a lot of levels. All 3 have history with one another. – This wasn’t the greatest T.L.C match of all time, but it certainly wasn’t the worst either. The days of huge spots, bloodshed and huge falls are over in this PG era we are currently in. With so many limitations on the match, I am surprised it ended up being as good as it was. All 3 competitors gave it there all in this title bout. It was the best match of the night and the best main event the WWE has had since Punk/Cena at MITB. – Poor Ricardo Rodriquez. The one guy who taking a huge fall off the ladder wasn’t even in the match. – Did you see that kick Alberto delivered to Punk on the top rope? Ouch. That looked like it got him right in the face. – The obvious choice to win the match was Punk. He wasn’t going to lose the title one month after winning it. He is the biggest star in the company right now. He needs to look as good as the gold around his waist. With the exception of the 3 matches that weren’t advertised to begin with, I thought the rest of the matches delivered in a big way.The United States Championship match got the show off on the right foot, Nash and HHH put on a better match than expected, Daniel Bryan cashed in his briefcase and then we end the night off with a great TLC match. It was a great show to end off the year. I am very surprised that John Cena didn’t make his presence known at all. I thought they would at least have had him in a backstage segment or have some sort of altercation with the returning Kane, but not this night. This pay per view belongs to the internet wrestling community. Zack Ryder is the United States Champion, Daniel Bryan is the World Heavyweight Champion, C.M Punk is still the WWE Champion, and John Cena is nowhere to be found. Enjoy the moment while it lasts IWC. This entry was posted in WWE and tagged Air Boom, C.M Punk, Cody Rhodes, Daniel Bryan, PPV, Randy Orton, TLC, WWE, Zack Ryder. Bookmark the permalink.